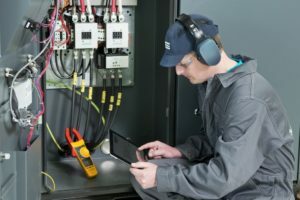 This measurement analyzes the operation of your compressor room, highlighting the power consumption used to produce compressed air in your plant. We have a device that can detect, without the shutdown of the compressors, the weekly consumption of compressed air in your air network that feeds the production plant. Once the data recording device is switched off, we are taking this collected data in order to elaborate in our software. After the elaboration you will receive a file containing the graphics with the values of the detected power consumption and all the recommendations in order to optimize the air consumption at your plant.